Edinburgh Filmhouse’s Mikio Naruse Season is a treat. I knew little about the director and hadn’t seen any of his film before this. But after watching When A Woman Ascends the Stairs, I ended up watching six out of twelve films on offer. It is rare to be able to watch so many Asian films in such short period in the UK. (Cinema China 07, which was also held in Edinburgh Filmhouse, was an exception.) Giving the fact that Mikio Naruse’s films are not well distributed in the West – some of the 16 mm prints were borrowed from German Japan Foundation, it makes this Mikio Naruse Season even a greater opportunity. What’s more, as I have realised graduately, is that his films are better watched in pairs. 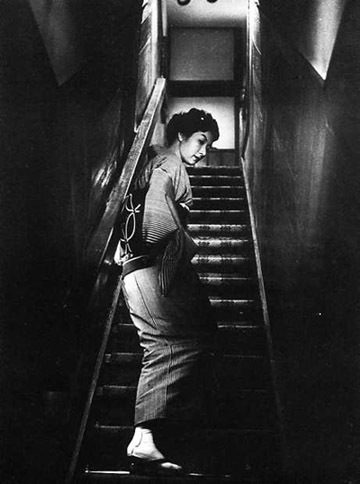 When A Woman Ascends the Stairs (1960) and Floating Clouds (1955), tell two different stories, but I can almost see them as two sides of the same woman. The fact that both films were starred by the beautiful Hideko Takamine makes the comparison more intriguing. Repast (1951) and Wife (1953) can be watched as the two episodes of the same marriage, which adds waryness to the happy ending of Repast (1951). Interestingly the husband in both films are played by the same actor Ken Uehara. Mikio Naruse’s films are immersed with Eastern philosophy. He had the near Taoistic pessimistic view of the world and yet very sympathetic towards the characters. His films always refrain from saving the characters from misfortune but yet avoiding making moral judgement on the men and women. Those films are wonderful work.